2008 was a year of exploration for Bollywood. Very few movies hewed to the cliched formula of rich boy/poor girl/disapproving parents that the industry has been mercilessly lampooned for over the years. The introduction of corporate entities in funding and the economics of the multiplex made it possible for young filmmakers to make smaller, more experimental movies and be assured of a reasonable amount of success. Stars like Shahrukh Khan and Aamir Khan sat on the bench this year, allowing younger talent to emerge. Not all the experiments were successes. Many low-budget movies, made with the best of intentions, tanked at the box-office. There was Dasvidaniya, the Vinay Pathak starrer and The Last Lear, a self-indulgent movie that did not succeed despite the presence of Amitabh, who also starred in another low-key dud, Bhootnath. Still, the industry deserves an E for effort. If the trend is towards strong scripts filmed on lesser-known actors, I am all for it. It is about time we created our Pacinos, Hoffmans and De Niros. 5. Jodha Akbar – Ashutosh Gowarikar’s paean to the best loved Mughal emperor, Jodha Akbar stands out as a lavish historical that worked, mostly due to the gorgeous Hrithik Roshan, who transformed people’s idea of Akbar from a podgy, stodgy medieval ruler to a character straight from the cover of a romantic fantasy. The battle scenes were beautifully shot and the chemistry between Hrithik and Aishwarya as Jodha kept the long movie from getting tedious. Even though the existence of Jodha is historically suspect, audiences took their kids along to give them a history lesson come to life. 4. Jaane Tu…ya jaane na – Talented scriptwriter Abbas Tyrewalla made his directing debut with this movie, a sweet college+ romance that introduced us to another talented member of Aamir Khan’s family, the innocent looking Imran Khan. With a perfect musical score by Rahman and a wholesome script, the movie got great word-of-mouth and did very well at the box office. Imran later attempted to play against his chocolatey looks in Kidnap, but that movie sank without a trace. 3. Rock On – Bollywood’s first movie about a rock band which did not devolve into a Mithun Chakraborty parody, Rock On was a surprisingly intelligent movie made by Abhishek Kapoor, with director Farhan Akhtar( Dil Chahta Hai, Don) in front of the camera as the lead. The excellent script and subdued direction made me go back and check out the director’s previous movie, Aryan, which turned out to be tolerable and could have made waves if cast better. Shankar, Ehsaan and Loy’s authentic rock music gave the movie a lot of credibility, though I could have done without the actors singing their own songs. Remember how you always felt you could do a good job singing Hindi songs in a Karaoke bar? In this case, you really can do better than the actual singers! 2. A Wednesday – A bona-fide thriller in the mould of The Negotiator, a Samuel Jackson/Kevin Spacey movie, A Wednesday was remarkable because it cast Anupam Kher and Naseeruddin Shah as the leads, a risky proposition at the box office. A gripping plot and terrific ensemble acting elevated this low-budget production to one of the best movies to emerge out of Bollywood this year . 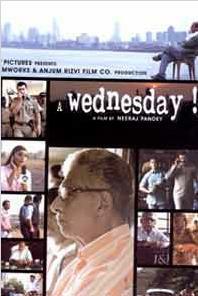 With a terrorism infused plot that is enormously relevant in the current environment, it would be great if A Wednesday made the shortlist for Oscar entries from India. 1. Slumdog Milionaire – Though this movie was directed by an Englishman, Slumdog Millionaire is pure Bollywood. Danny Boyle perfectly captures the masala-infused atmosphere of Mumbai, where slums and high-rises coexist uneasily, where a chaiwalla can dream of being a millionaire. A.R. Rahman once again demonstrates his brilliance with a score that is jangly and discordant at times, electric at others, making it an integral part of the fast-paced action adventure. The high-octane drama also captured the imagination of the venerable folks over at the Academy of Motion Picture Arts and Sciences in Hollywood and it is generating Oscar buzz. UPDATE: I see from the comments that lots of viewers want to nominate Ghajini for the best movie of 2008. To my mind, a frame-by-frame remake of a Tamil movie does not qualify for contention in best movie..if anything, it should have been up for judging in 2005, when the Tamil movie was released. Also read my review of Ghajini where I attempt to explain my problems with the movie and why it did not make it to the top spot. This entry was posted in Entertainment, Movie Review on December 19, 2008 by vpdot. Ghajini is the best till 2008, Ghajini Rockss!! 🙄 i m sure bset movi in 2008 rab ne bana di jodi 7 second intresting movi that is gajni amir khan starer.